This four-part article series provides an in-depth look at periodontal (gum) disease: what it is, how it presents, how it can be prevented and what treatment options are available for those who have it. Just the words “periodontal disease” sound quite exotic and frightening... like a rare condition you can only pick up from the monkeys hanging around outside some Buddhist temple in the virginal jungles of Southeast Asia. But periodontal disease is shockingly common amongst Americans. According to the U.S. Surgeon General, 85% of the population has it, which means that if you’re standing in an elevator with 9 other people, there’s a very good chance you are one of those affected! Periodontal disease is perhaps better known as gum disease and its prevalence in our society is testament to the fact that most people simply don’t know how to look after their teeth properly. In this four-part article series, specialists of denture implants in Houston Texas will help us achieve a much greater understanding of the disease responsible for the loss of millions of teeth every year in our country. We will be looking at the answers to questions ranging from “what is periodontal disease” and “what are its causes?” to “how can I prevent it?” and “what are the treatment options available.” Remember, when it comes to the health of your teeth and gums, and therefore the natural beauty of your smile, prevention is always better than cure, so the focus of this article series will be on understanding how to prevent gum disease. 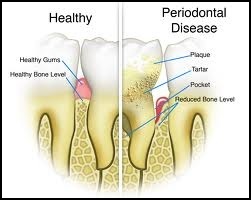 Periodontal or gum disease is an advanced (severe) bacterial infection of the gums surrounding the teeth and the underlying jawbone tissue - peri means “around” and dontal means “of the teeth”. Gum disease begins as a mild infection of the gums, at which stage it is referred to as gingivitis. If left undiagnosed and untreated, this common condition can lead to a slew of terrible symptoms including gum recession and rampant tooth loss. Periodontal disease is caused by the unchecked activity of oral bacteria. Therefore, any behavior, habit or neglect that fosters an environment favorable for bacterial growth can leave you at a heightened risk of infection and disease. “Poor oral hygiene, smoking, excessive drinking, certain medications, certain chronic illnesses, a diet high in sugar and starch and not seeing your dentist and oral hygienist for regular scheduled appointments are all risk factors for gum disease,” explain denture implant dentists in Houston Texas, the professionals responsible for mitigating the damage done by this condition. Other factors out of your control, such as your genetic heritage, hormonal fluctuations and even your gender can leave you at a higher risk of gum disease! If you have a family history of this condition, are male or are experiencing hormonal instability (pregnancy or menopause) it’s imperative that you take extra care of your teeth and gums and seek regular professional dental healthcare. Preventing gum disease and tooth loss is a lifelong endeavor that requires effort and attention. Stay tuned for the next installment of this four-part article series in which All On 4 Implant specialists will be explaining the exact mechanisms of periodontitis as viewed at the microscopic level.